In the spotlight, a selection of special edition Jeep models, including the new “S” range created to enhance the sporty appeal of the brand. New “S” range – The “S” special edition Renegade, Compass, Cherokee and Grand Cherokee make their European debuts at the Geneva Motor Show. The new Cherokee Trailhawk completes the Trailhawk family with all of the Jeep SUVs now sporting the prestigious “Trail Rated” badge, a symbol that signifies the ability to successfully tackle even the most challenging off-road trails. A Mopar® edition of the Wrangler Rubicon with a 100% street legal configuration, enhanced by Jeep Performance Parts and capable of expressing the undisputed off-road capability of the vehicle, will be a centrepiece of the stand. A 2-inch suspension lift kit, “snorkel”, “rock rails”, black door sill guards, “black fuel door”, all-weather mats and 1941 sticker add to the specific configuration of this model. The vehicle also features some Jeep® Authentic Accessories by Mopar. These are selected from the range of over 200 accessories dedicated to Jeep Wrangler and include: Matt Black seven-slot grille, moulded splash guards, off-road lights and mirror caps – all contrasting with the Hella Yella yellow paintwork. These accessories are fully capable of providing the best in terms of functionality, safety, style and performance because they are created by the same teams that designed the original vehicle. The Mopar customisation continues inside, where a black mesh sun bonnet, front grab handles and tailgate table enhance the vehicle’s functionality. Mopar experts have also turned their attention to the Jeep Renegade. Displayed in the Limited trim level, the Renegade model on the Jeep stand features an all-new Bikini body-colour exterior paired with Polar Plunge leather interior, and is characterised by a special urban customisation, including rear scuff plate, front dam, unique side mouldings and door sill guards with Jeep logo – all in Subshine Grey which is the same colour as the mirror caps and front grille. The cabin offers a cargo organizer and carpet mats. For the first time at a motor show in Europe, the Jeep brand will display the new “S” range. Created on Renegade, Compass, Cherokee and Grand Cherokee models, the new “S” line-up boldly enhances the sporty, metropolitan appeal of the Jeep SUVs, while reasserting their legendary off-road capabilities. 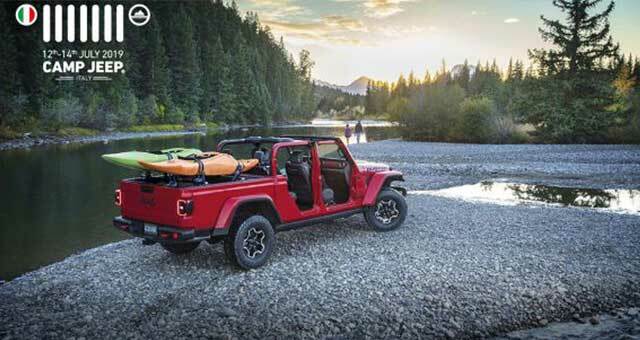 They represent the values of freedom, authenticity, adventure and passion that belong to the Jeep brand in an urban environment of daily commuting as much as beyond. The new Jeep Renegade “S” on display features Alpine White exterior. Based on the top-of-the-range Limited version, it boasts a sportier look with black roof and Low Gloss Granite Crystal accents on its iconic seven-slot front grille and several badges (“4×4”, “Jeep”, “Renegade” and “S”). Model-specific roof bars and exclusive Granite Crystal 19-inch alloy wheels complete the exterior look of the special edition model. The sporty appeal of the new “S” special edition continues inside where premium seats with tungsten stitching and a leather-wrapped steering wheel with black stitching enhance the dark, all-black environment and a host of user-friendly technology is found, including the innovative UconnectTM 8.4-inch NAV which integrates Apple CarPlay and Android AutoTM. Additional exclusive features for comfort and safety include Adaptive Cruise Control, Forward Collision Warning, dual-zone automatic A/C, front and rear parking sensors and a Full Pack LED, which includes LED daytime running lights, headlamps, fog lamps and tail lamps. Under the bonnet of the model on display, there is a new 1.3-litre Turbo T4 engine delivering 180 hp with a nine-speed automatic transmission. The engine line-up also includes the 1.3-litre Turbo T4 engine delivering 150 hp, the 1.6-litre Multijet II diesel paired with a six-speed manual transmission or a six-speed DDCT and the 2.0-litre Multijet II 4×4 paired with a nine-speed automatic transmission. 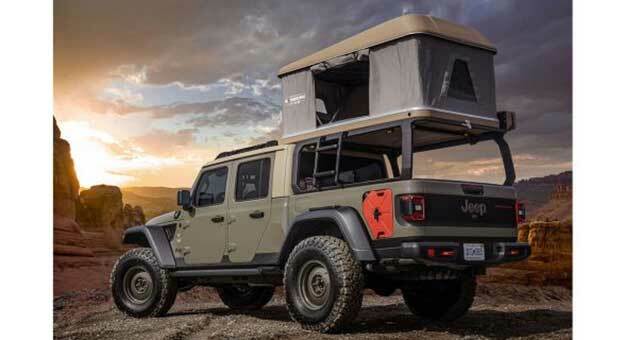 Legendary Jeep off-road capability comes courtesy of its advanced 4×4 system, rear axle disconnect, Selec-Terrain traction control and Hill Start Assist. 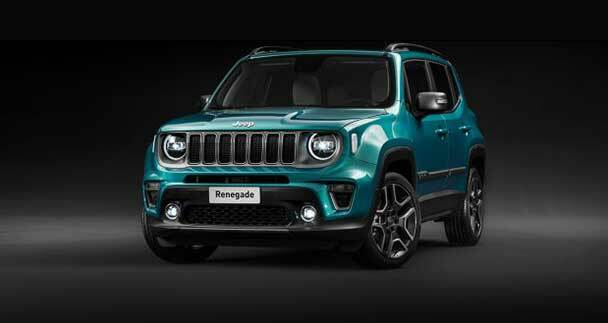 Jeep Renegade “S” will be introduced in selected European markets during the second quarter of this year. The new Compass “S” is joining the line-up of the best-selling Jeep model and making its European debut in Geneva. Designed to enhance its sporty and metropolitan look, the new “S” offers sophisticated styling with comprehensive equipment created for customers who want to stand out. In addition to state-of-the-art off-road technology, it offers excellent on-road driving dynamics and is packed with over 70 passive and active safety systems. The Jeep Compass “S” on show in Geneva features a two-tone Pearl White exterior with black roof (standard on the “S”) and new specific 19-inch Low Gloss Granite Crystal wheels. The same unique finish is found on the badges (“4×4”, “Jeep” and “S”), front grille, fog lamp outer bezels, lower fascia applique and signature daylight opening (DLO) surrounds. Inside, it sports a black leather interior with contrasting tungsten colour stitching, anodised Gun Metal central console bezel and the best in terms of connectivity courtesy of the UconnectTM 8.4-inch NAV system. Other features of this special edition include Bi-Xenon headlights, automatic high beams, power tailgate, Adaptive Cruise Control, Beats sound system and electric 8-way seats. The vehicle on display on the Jeep stand is powered by a 2.0-litre Multijet 170 hp engine paired with a nine-speed automatic transmission and four-wheel drive. The engine line-up available on the new “S” also includes the 1.4-litre petrol engine delivering 140 or 170 hp (paired with a six-speed manual or a nine-speed automatic transmission four-wheel drive), the 1.6-litre Multijet II delivering 120 hp with manual transmission and the 2.0-litre with 140 or 170 hp paired with a nine-speed automatic transmission. In markets outside Europe, a 2.4-litre petrol engine delivering 150 hp or 175 hp is offered in combination with a nine-speed automatic transmission and four-wheel drive. The new Jeep Compass “S” will be launched in Jeep showrooms across Europe in the second quarter of this year. The new Cherokee “S” special edition model adds a bold, sporty connotation to the evolution of the most capable mid-sized SUV that’s just as at home with the demands of modern city living as it is with adventures off the beaten track. The new “S” special edition model boasts a sporty appeal conveyed by distinctive styling cues which are combined with specific internal content inspired by comfort and luxury. Striking the right balance of tradition, advanced technology, craftsmanship and design, the exterior style of the new special edition was inspired by the more upscale and premium nature of the Jeep family and is expressed in a well-balanced, contemporary package featuring Pearl White exterior and special interior finishes. On the outside, the new Cherokee “S” features specific satin gloss Granite Crystal Metallic 19-inch wheels, body colour lower front fascia and fender flares, dedicated “S” badge, satin gloss Granite Crystal Metallic accents for both the ‘Jeep’ and ‘4×4’ badges, roof rails and fog lamp bezels. The cabin is loaded with innovative technology and plenty of space offered in a sophisticated environment characterised by sculpted shapes and superior quality materials. Exceptional attention to detail is expressed with Nappa leather black interior fabrics featuring tungsten accent stitching on seats, armrests and centre console and features picked to ensure the highest level of interior comfort. Additional equipment includes UconnectTM 8.4-inch NAV with Apple CarPlay integration and Android AutoTM compatibility, Adaptive Cruise Control with Stop & Go, Active Speed Limiter, Forward Collision Warning Plus with pedestrian recognition, Advanced Brake Assist, Lane Departure Warning Plus, Blind Spot Monitoring, Rear Cross-Path Detection, Keyless Enter-N-GoTM, front and rear parking sensors and Parallel & Perpendicular Park Assist. All these features deliver comfort, safety and power – the latter comes courtesy of the powerful 2.0-litre Turbo 270 hp petrol engine paired to a nine-speed automatic transmission and four-wheel drive, which completes the engine range available for the new Cherokee and which is fitted to the car on display on the stand in Geneva. In Europe, the commercial launch of the new Cherokee “S” is scheduled for the second quarter of the year. Jeep Grand Cherokee created the premium SUV category 26 years ago. With over six million sold since its first introduction, it continues to represent the benchmark in its category this year with the new S Limited. Based on the Limited trim level, the new S Limited stands out for its unique, bold and sporty style. The exterior features distinctive design cues from the Grand Cherokee SRT model – the SUV that combines racing performance with Jeep off-road capability. Front and rear fascias boast a model-specific design with Low Gloss Granite Crystal finishes. The new special edition model sports SRT-style performance hood, while the bespoke side skirts and the unmistakably Jeep fender flares, capable of evoking strength and elegance, provide a stand-out appeal. The exterior is completed with a burnished exhaust tip and Low Gloss Granite Crystal 20-inch alloy wheels, with chrome lug nuts. This sporty appeal is found in the cabin which features the same “blacked-out” theme of the vehicle’s exterior along with a new Piano Black integrated centre stack. The interior also offers specific black ventilated leather-wrapped perforated front seats with heated cushions and backrests. A high-tech new infotainment package adds to the appeal, while the new S Limited also offers a premium Alpine sound system with digital amplifier, Active Noise Cancellation, nine speakers, subwoofer and the latest generation of the UconnectTM 8.4″ system with navigation, bonded glass design, Apple CarPlay and Android AutoTM. The introduction of the new S Limited special edition also marks the market launch of the 2019 Model Year line-up of the most-awarded SUV ever. In addition to the updated interior featuring a redesigned centre console, new technology for improved comfort and safety will make the Jeep flagship even more appealing. Major exterior enhancements include all-new finishes, new wheels and three new exterior paint colours – Slate Blue, Green Metallic and Sting Grey. Just a few months after the launch of the new Cherokee, the Trailhawk trim is joining the Cherokee range and completing the trailblazing family of off-road-specialist versions. Trailhawk models embody not only the no-compromise attitude that characterises each single vehicle carrying the unmistakable seven-slot grille, but also their legendary off-road capability, which represents a straight, unmistakable connection to the brand’s roots. 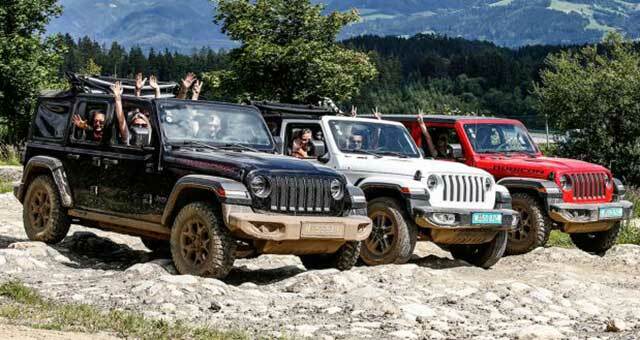 They offer the best in terms of 4×4 prowess in each segment where the Jeep brand is present. The first Trailhawk model was introduced on the current generation Cherokee launched in 2014, which was followed by the Renegade, Grand Cherokee and Compass. The Trailhawk family proudly sports the famous “Trail Rated” badge which is awarded only after passing a number of gruelling tests on some of the toughest terrain in the world. Featuring an aggressive look and stance, it immediately exemplifies ‘trail readiness’ as the most capable mid-size SUV in its category. The Trailhawk is loaded with Jeep off-road hardware, 17-inch off-road tyres, aggressive approach and departure angles, unique front and rear fascia and skid plates, in addition to a 2-centimetre factory lift. Its unmatched 4×4 capability is enhanced with Jeep Active Drive Lock and its locking rear differential that maximises traction on extreme terrain and Selec-Terrain with five modes, including Rock, which is exclusive for the Trailhawk trim. The Jeep Cherokee Trailhawk boasts an approach angle of 29.9-degrees, a departure angle of 32.2 degrees and breakover angle of 22.9-degrees. Ground clearance is equivalent to 22 cm. The Jeep Cherokee Trailhawk also follows the Jeep “Trail Rated” tradition. The “Trail Rated” badge on the Firecracker Red Clear Coat livery of the vehicle on show in Geneva certifies that it was designed to perform in a variety of challenging off-road conditions identified by five key performance categories: traction, ground clearance, maneuverability, articulation and water fording. Powered by a new 2.0-liter turbo petrol engine delivering 270 hp and 400 Nm paired with a nine-speed automatic transmission, the Trailhawk vehicle on display is equipped with front and rear parking sensors, Adaptive Cruise Control, UconnectTM 8.4-inch navigation system with Apple CarPlay and Android AutoTM, configurable 7-inch TFT colour screen, and a Premium sound system with nine speakers and subwoofer. The complete safety equipment inventory comprises Active Speed Limiter, Forward Collision Warning Plus with pedestrian recognition, Advanced Brake Assist, Lane Departure Warning Plus, Blind Spot Monitoring, Rear Cross-Path Detection, Keyless Enter-N-GoTM and Parallel & Perpendicular Park Assist. The new 2.0-litre petrol engine is making its European debut on the Cherokee Trailhawk joining the 2.2-litre turbo diesel that was already available in the Cherokee range from launch. This engine is offered on all 4×4 versions of the Cherokee line-up (except for the Sport). 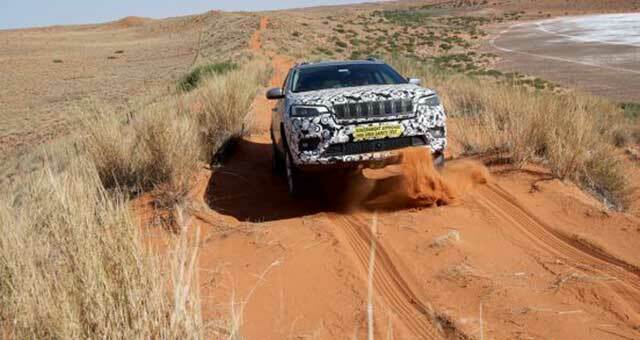 The new 2.0-litre petrol will be the only engine option available on Cherokee Trailhawk. 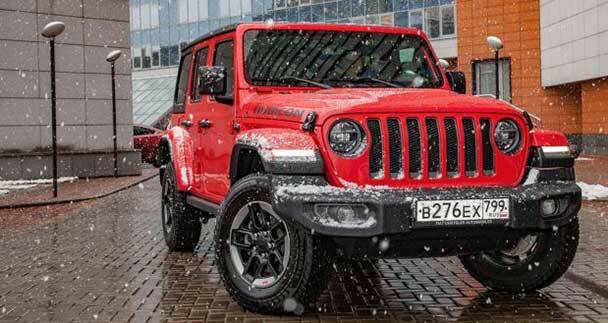 It will be available for sale in Jeep showrooms across Europe from April. The Night Eagle special edition gives the design of the Compass added exclusivity, delivering a bolder, sportier look to the Jeep C-SUV. The exterior features black accents treatment and the vehicle is enhanced by a generous standard equipment list. The dark look, which is one of the distinctive features of the Night Eagle special edition and which has recently characterized other Jeep models, perfectly complements the unmistakable style of Compass. The grille, fog lights and halogen headlight bezels are Gloss Black to convey an aggressive appearance to the vehicle’s front. The characteristic daylight opening trim (DLO) is black, while the “Jeep” and “4×4” badges pick up the dark theme which is found throughout the exterior of this special edition model. The Compass Night Eagle is equipped with 19-inch tyres mounted on Gloss Black and Diamond Cut aluminium alloy wheels that further enhance its aggressive stance. The dedicated Night Eagle badge completes the look of this new special edition model.